If you are unfamiliar with what stock market bears and bulls are, you can refer to our Bulls vs Bears to get a background. Occasionally, a stock will breakout to the upside, fall back into support, and then continue to decline to new lows. This action, which leaves all the new holders of stock with losses in their account, is known as a bull trap. When stocks break out to new highs it encourages many players to either add to existing positions or initiate new positions in a stock. This action of renewed strength also encourages short sellers to buy back their stock before they suffer large losses. What happens next is that this strength brings into play a large supply of stock that was not anticipated to be for sale at these levels. This new supply most likely comes from a large institutional holder that has been waiting for strength to sell out of any remaining position it may still be holding after the stock has made a big upward move. The new supply pushes prices back into the base and then down through the support level that was previously holding it up. Many times, the follow-through to the downside is quick and severe as stops are hit, short sellers become more aggressive, and those long the stock sell out before their profits evaporate. Those who did not have an exit strategy in place will quickly be left with losses that may become substantial. Having a plan in place for handling the risk will prevent these losses from becoming large and preserve trading capital for other ideas. A bear trap is the reverse of a bull trap. A bear trap occurs when a stock breaks down through a support level, looks like it is going lower, then suddenly reverses back up through the previous resistance and continues higher. All the people who were looking to profit from further downside action by selling short are now ‘trapped’ and begin to suffer losses as the stock moves higher. The completion of a bear trap can often lead to a big upward move due to the number of buyers competing to buy stock. At this point, the buyers who overcame the selling and forced the stock higher will become more aggressive. Another group of buyers will see a big surge in volume and be attracted to the potential for quick profits, which helps deplete any supply quicker. A third group will enter a stock in this situation; they are the market professionals who specialize in “squeezing shorts.” These savvy players will monitor the short interest in a stock and once they see that the short sellers are in trouble, they will enter the market and buy as much stock as they can to produce losses for the short sellers. Once the shorts have a position moving against them, they become overrun by fear and start to buy back their shares quickly to limit their losses. A final factor that helps the stock move up quickly is that the ‘weak holders’ of stock were most likely shaken out of their positions as it first broke down and that element of supply has been taken out of the equation. The stock market is not a nice place and others are trying to take money away from those who are less informed or slower to act. These traps can be vicious in the way they eventually play out if you are on the wrong side of them. Aggressive traders should be on the lookout for these setups because the profits that follow can be large and quick. Bull and bear traps can be found on a fairly regular basis on daily charts, and they occur with regular frequency on intraday charts. The reason that bull/bear traps occur more on these charts is that it is easier for market makers and specialists to manipulate stocks on a short-term basis. Many short-term players let their emotions get in the way of what the long-term trend may be. The ability to recognize these opportunities will allow you to make rational choices in your trading decisions. These patterns, or false patterns, are important to recognize and will remind you to listen to what the market is telling you. 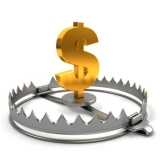 If you get caught in a trap, you must act immediately by taking your loss before it turns into a disaster. If you are really aggressive, you may want to turn around and go the other way (if you were long on a false breakout, sell the long stock and then sell short additional stock). For more stock market advice, you can learn about beginning to trade, some trading basics, or even advanced trading strategies. Have you ever experienced a bull or bear trap personally? Leave your comment below!